Plantain (வாழைக்காய்) is rich in vitamin A, B6 and C, as well as minerals and dietary fiber. Though plantain can be cooked in different ways, ‘spicy plantain fry’ made with curry masala powder, is the most popular recipe in my home. 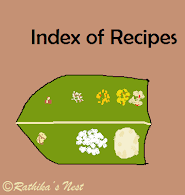 It is yummy, tasty and goes very well with rice and sambar or rasam. Try this recipe when you cook plantain next. Method: Wash and peel the plantain. Slit it into two halves vertically. Cut the slit half into thin slices. Soak the cut pieces of plantain in water immediately, lest the pieces will turn dark if left exposed to air. Slice the onion and keep aside. Heat oil in a kadai, add mustard seeds, when they start to sputter, add urad dhal and peppercorns. Fry till the dhal turns golden brown. Add onion slices and fry till they become transparent. Add the sliced plantain, turmeric powder, curry masala powder and salt and mix well. Cover and cook on low flame. Do not add water. Once the vegetable is cooked, remove the lid and cook on low flame till oil separates. Switch off the stove and garnish with curry leaves. Serve hot with rice and rasam or sambar.